Apple CEO Tim Cook has been in China the past few days meeting with senior officials from both companies and the Chinese government. He has already been spotted at an Apple Store in China, and now Apple has confirmed that Cook went on a personal tour inside of a Foxconn plant. 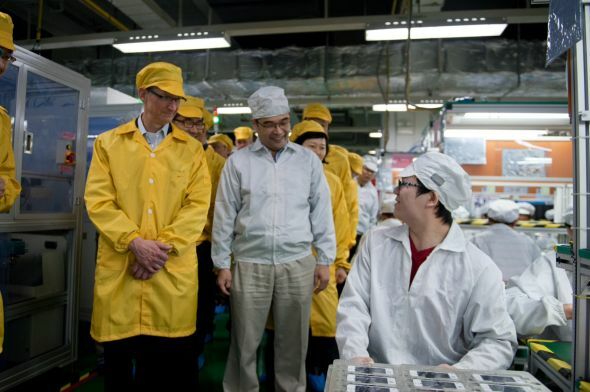 Cook reportedly visited a newly instated iPhone manufacturing section within Foxconn. Foxconn has been the source of many Apple product-production based controversies as of late, and Cook, notably, emailed his staff a lengthy response addressing concerns of worker safety and other topics. One more image (via iFeng) of Cook’s Foxconn visit is after the break.